"Its singleness is only an apparent limitation, for by impressing upon it numerous non-interfering vibrations, the flow of energy may be directed through any number of paths which, though bodily connected, are yet perfectly distinct and separate like ever so many cables. Any apparatus, then, which can be operated through one or more wires, at distances obviously limited, can likewise be worked without artificial conductors, and with the same facility and precision, at distances without limit other than that imposed by the physical dimensions of the globe". "It is intended to give practical demonstrations of these principles with the plant illustrated, dictate instructions, and have them instantly appear in type elsewhere, talk to any telephone subscriber on the globe, hear anywhere music orsong, speech, picture, character, drawing, or print transferred from one to another place millions of instruments operated from one plant transmission of power shown". 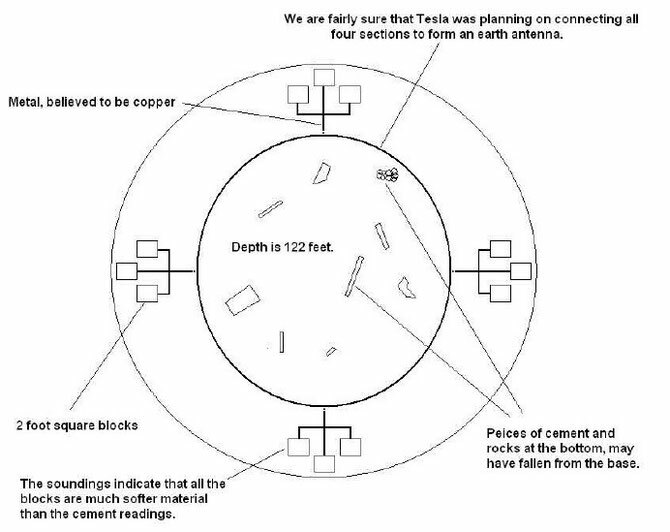 Tesla felt the resistance of the Earth would be negligible due to its immense cross sectional area and relative shortness as compared to its diameter. (Corum & Corum) The key to good performance is a robust ground connection. "You must first understand certain things. Consider, for instance, the term "resistance." When you think of resistance you imagine, naturally, that you have a long, thin conductor; but remember that while resistance is directly proportionate to length, it is inversely proportionate to the section. It is a quality that depends on a ratio. If you take a small sphere of the same size of a pea, and compare its length with its section, you would find a certain resistance. Now you extend this pea to the size of the earth, and what is going to happen?" "While the length increases, say a thousand times or a million times, the section increases with the square of the linear dimensions, so that the bigger this thing is the less resistance it has. Indeed, if the earth were as big as the sun we would still be better off than we are; we could readily telephone from one end of the sun to the other by the system, and the larger the planet the better it would be. . . . The resistance is only at the point where you get into the earth with your current. The rest is nothing". "By proper design and choice of wavelengths, you can arrange it so that you get, for instance, 5 percent in these electromagnetic waves and 95 percent in the current that goes through the earth. That is what I am doing". Tesla often spoke of the electrical disturbance being in the form of an electrical current flowing through the earth. As with any electrical current flowing through a conductor surrounded by an insulating medium, there is also an electrical disturbance in the material or space adjacent to that conductor. In the case of the World System, this is a surface wave traveling along the interface between the ground and the air. The wave energy is associated with the ground current. It does not radiate freely into space but tends to be concentrated near the surface of the conductor, i.e., the guiding surface. This is equivalent to the fields associated with an electrical current flowing in a wire. "126 x-Q. In this system, then, as you have described it, the current actually flows from the transmitter through the ground to the receiver; is that so?" "The attractive feature of this plan was that the intensity of the signals should diminish very little with the distance, and, in fact, should not diminish at all, if it were not for certain losses occurring, chiefly in the atmosphere". Another important component of Tesla's Long Island apparatus was an underground array of iron pipes which extended outward from the bottom of a deep shaft beneath the transmitter tower. When coupled with the transmitter these pipes provided a connection to the earth through which a powerful oscillating electrical current would flow. Unlike a conventional radio transmitter with an antenna that radiates dissipating electromagnetic waves out into space, the magnifying transmitter's extra coil excites a low-frequency ground wave called the Zenneck surface wave. In this case the propagating energy does not radiate into space but is concentrated near the earth's surface. Furthermore, Tesla asserted that it is possible to periodically disturb the equilibrium of the earth's electrical charge and cause it to oscillate with his apparatus. This would be accomplished by superposing an extra low frequency baseband signal on the somewhat higher frequency signal coursing through the resonator -- the low frequency current in the presence of an enveloping corona-induced plasma of free charge carriers produced by the oscillator in effect "pumping" the earth's charge. "In this system that I have invented it is necessary for the machine to get a grip of the earth, otherwise it cannot shake the earth. It has to have a grip on the earth so that the whole of this globe can quiver, and to do that it is necessary to carry out a very expensive construction. I had in fact invented special machines". ". . . There was a big shaft about ten by twelve feet goes down about one hundred and twenty feet and this was first covered with timber and the inside with steel and in the center of this there was a winding stairs going down and in the center of the stairs there was a big shaft again through which the current was to pass . . ."
"And then the real expensive work was to connect that central part with the earth, and there I had special machines rigged up which would push the iron pipe, one length after another, and I pushed these iron pipes, I think sixteen of them, three hundred feet, and then the current through these pipes takes hold of the earth. Now that was a very expensive part of the work, but it does not show on the tower, but it belongs to the tower". Two other seemingly applicable patents filed for within the specified time period and patented in 1900 are US787,412, “Means for Increasing the Intensity of Electrical Oscillations,” (wrong reference and date according to the patent name, which corresponds to US685,012 - Means for Increasing the Intensity of Electrical Oscillations - October 22, 1901) and US655,838 - Method of Insulating Electric Conductors reissued as US11,865. Both of these inventions might have been useful for improving the Wardenclyffe plant's performance; the first for the magnifying transmitter itself, the second for improving high-voltage power transmission between the lab building and the tower structure. At the base of the edifice, deep below the earth, along the descending spiral staircase, was a network of catacombs that extended out like spokes of a wheel. Sixteen of them contained iron pipes which protruded from the central shaft to a distance of three hundred feet. The expense for these "terrestrial grippers" was notable, as Tesla had to design "special machines to push the pipes, one after the other. Also in the well were four stone-lined tunnels, each of which gradually rose back to the surface. Large enough for a man to crawl through, they emerged like isolated, igloo-shaped brick ovens three hundred feet from the base of the tower. Although the exact reason for the burrows has not been determined, their necessity was probably multifaceted. 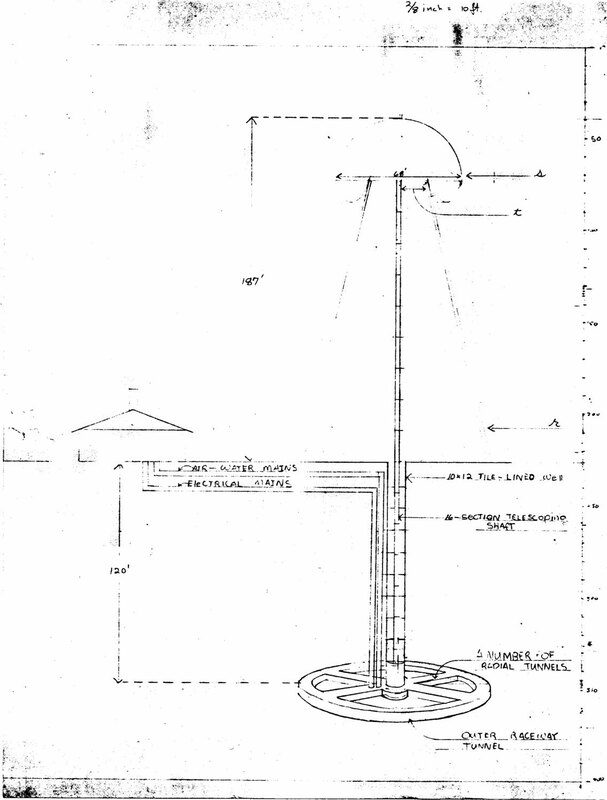 Tesla had increased the length of the aerial by over a hundred feet by extending the shaft into the earth. Simultaneously, he was able to more easily transmit energy through the ground with this arrangement. It is possible that he also planned to resonate the aquifer which was situated slightly below the bottom of the well. The insulated passageways which climbed back to the surface may have been safety valves, which would have allowed excess pressure to escape. They also provided an alternative way to access the base. Tesla may have planned to fill other shafts with salt water or liquid nitrogen to augment transmission. There may have also been other reasons for their construction. The huge mushroom-like tower gave the aura of a futuristic, Martian giant and local residents called it “Tesla’s Magic Tower.” Nikola Tesla planned to build another two towers to duplicate the tower with the large sphere on top. The three towers, one for each powerhouse, would each have a 500-foot well. The water at the bottom of the well was to be kept warm and was not to exceed a certain temperature (and could be also because of the conductivity of the water?). Excavation was planned to continue down to 500 feet. "In this system that I have invented it is necessary for the machine to get a grip of the earth, otherwise it cannot shake the earth. It has to have a grip on the earth so that the whole of this globe can quiver, and to do that it is necessary to carry out a very expensive construction. I had in fact invented special machines. There was a big shaft about ten by twelve feet goes down about one hundred and twenty feet and this was first covered with timber and the inside with steel and in the center of this there was a winding stairs going down and in the center of the stairs there was a big shaft again through which the current was to pass, and this shaft was so figured in order to tell exactly where the nodal point is, so that I could calculate every point of distance. For instance I could calculate exactly the size of the earth or the diameter of the earth and measure it exactly within four feet with that machine. The real expensive work was to connect that central part with the earth, and there I had special machines rigged up which would push the iron pipe, one length after another, and I pushed these iron pipes, I think sixteen of them, three hundred feet, and then the current through these pipes takes hold of the earth. Now that was a very expensive part of the work, but it does not show on the tower, but it belongs to the tower." "I read some statements from Carnot and Lord Kelvin (then Sir William Thomson) which meant virtually that it is impossible for an inanimate mechanism or self-acting machine to cool a portion of the medium below the temperature of the surrounding, and operate by the heat abstracted. These statements interested me intensely. Evidently a living being could do this very thing, and since the experiences of my early life which I have related had convinced me that a living being is only an automaton, or, otherwise stated, a "self-acting-engine," I came to the conclusion that it was possible to construct a machine which would do the same. As the first step toward this realization I conceived the following mechanism. Imagine a thermopile consisting of a number of bars of metal extending from the earth to the outer space beyond the atmosphere. The heat from below, conducted upward along these metal bars, would cool the earth or the sea or the air, according to the location of the lower parts of the bars, and the result, as is well known, would be an electric current circulating in these bars. The two terminals of the thermopile could now be joined through an electric motor, and, theoretically, this motor would run on and on, until the media below would be cooled down to the temperature of the outer space. This would be an inanimate engine which, to all evidence, would be cooling a portion of the medium below the temperature of the surrounding, and operating by the heat abstracted". "Much of this task on which I have labored so long remains to be done. A number of mechanical details are still to be perfected and some difficulties of a different nature to be mastered, and I cannot hope to produce a self-acting machine deriving energy from the ambient medium for a long time yet, even if all my expectations should materialize". The mind conditioned by Hertzian aerial radio concepts has trouble grasping the idea that signaling can take place without any above-surface antenna, totally through the ground. James Harris Rogers, taking a cue from Tesla, circa World War I, built a radio system in which both sending and receiving antennas were sunk completely into the ground or submerged in bodies of water. He found this system far more effective and far less vulnerable to interference than any aerial radio Signal strength has been said to be 5,000 times stronger. The military is on to this, as evidenced in the Navy's ELF and by a U. S. Air Force project underway called Ground Wave Emergency Network. GWEN is a low-frequency communications system designed for used during a nuclear war. The network will have a cross-continent series of 600-foot diameter underground copper screens connected to 300-foot towers reminiscent of Tesla's Wardenclyffe. Among the advantages of the system is its invulnerability to the effects of the electric pulse sent out by nuclear blasts. Such a pulse fries at one stroke any and all solid-state electronics within its extensive range. (Strong electric vibrations from a Tesla coil or magnifying transmitter have a similar effect on solid state and will scramble or disable such circuitry temporarily or even dud it permanently.) It's revealing that for last-ditch doomsday communications, the government reverts to Tesla's grounded radio. In discussing this material will quote Tesla's actual notes whenever possible. "Sparks went over the lightning arrestors instead of going to ground. This made it necessary to change the connection to the ground, separating that of the secondary of the oscillator from the ground of the arrestors. By connecting the secondary to a water pipe, and leaving the ground of the arrestor as before, the sparks ceased. This indicates a bad ground on the arrestors. The latter worked exceedingly well The ground connection was made by driving in a gas pipe about 12 feet deep and gammoning coke around it. This is the usual way as here practised." First note that arcing was occuring from the earth connection over the arrestors. This shows that the lightning arrestor ground, an iron gas pipe driven twelve feet into the earth, was insufficient for even a low power test. Tesla clearly recognizes the differences between the two grounds he has available. The capitalized sentence above was in italics in the original. His setup is brand new. His tune is rough. The following day, June 16, 1899, he had workmen going full tilt on a dedicated RF ground for his experiments. "A new ground connection was made by digging a hole 12 feet deep and placing a plate of copper 20" x 20" on the bottom and spreading coke over it again, as customary. Water was kept constantly flowing upon the ground to moisten it and improve the connection but in spite of this the connection was still bad and to a remarkable degree. It is plain that the rocky formation and dryness is responsible and I think that the many cases of damage done by lightning here are partially to be attributed to poor earth connections. By keeping the water constantly running the resistance was finally reduced to 14 ohms between the earth plate and the water main." 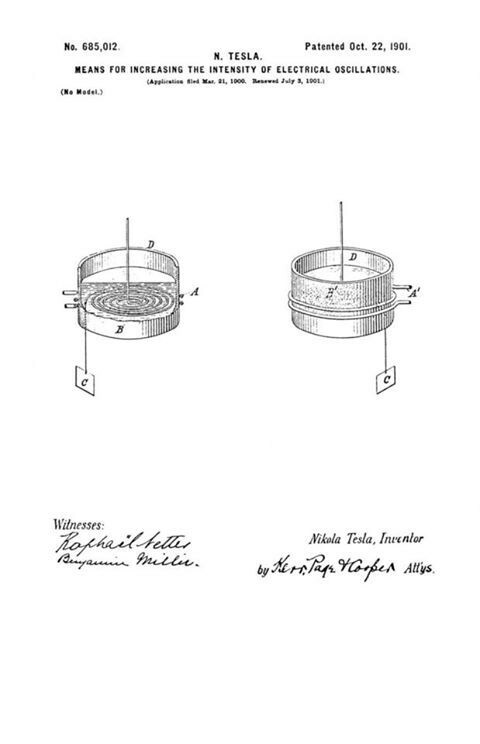 Tesla clearly notes the indivuality of the water pipe and the earth plate, just as earlier he noted the difference between the arrestor ground and the water pipe. I will call the earth plate the "dedicated RF system ground" or simply "system ground". In text following the quote above, Tesla next refers to using a "sensitive device" to determine the presence of a ground current around the lab. I have used resonate pickup coils with a small neon indicator bulb on the air terminal, or even a low pressure gas tube to detect ground currents. "Measurements of resistance between ground wire and water mainshowed the surprising fact that it was 2960 ohms, and even afterhalf an hour watering it still was 2400 ohms, but then by continued watering it began to fall rapidly. Evidently the soil lets the water run through easily and being extremely dry as a rule it is very difficult to make a good connection. This may prove troublesome. The water will have to be kept flowing con-tinuously. The high resistance explains the difficulty, from a few days before, of getting the proper vibration of the secondary. The first good ground was evidently at the point where the water main feeding the laboratory connected to the big main underground and this was several hundreds of feet away. This introduced additional length in the secondary wire which became thus too long for the quarter of the wave as calculated. The nearest connection to earth was as measured about 260 feet away and even this one was doubtful." OK, Tesla has said a mouthful. First his measure of resistance when the water is off overnight skyrocketed. Though the water expense was unbudgeted, it ran 24-7. (The bill was finally paid when the wood used in construction was sold after the building was dismanteled.). This shows that Tesla was determined that no expense was to be spared in obtaining the lowest resistance ground connection possible. Tesla then notes that the first true electrical ground point occurs on the water main at the junction to the laboratory supply pipe. He notes at the end of the quote that even this ground point is doubtful, possibly because his equipment is powerful enough to push the center of the "true electrical ground point" further up the main. conductor length in all secondary calculations. This distance between the base of the secondary coil and the "true ground"
affected his ability to determine the resonate frequency of the grounded coil and kept him from establishing a sharp tune in the system. Add the fact that the location of the true electrical ground point on the pipe may not be stable, and would possibly move farther away with increasing power levels, meant that the water pipe would be completely unsatisfactory for use as the system RF ground. 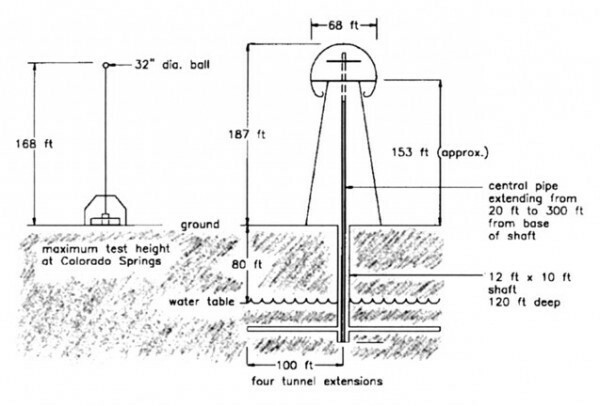 To jump ahead to page 125, the section notes indicate that stationary standing waves were observed on the water pipe, and the exact electrical distance from the ground plate to the electrical node on the pipe was determined to be 550 feet. This would be an unpleasant amount of uncoupled conductor to add to any secondary coil. In conclusion, Tesla recognized the need for a dedicated RF ground in his coil systems. His specifications were such that the true electrical ground point for the system ground had to lay as close as possible to the base of the secondary coil. He recognized the need for a highly conductive pathway adapted for low frequency high-voltage RF. Tesla’s “World System” for wireless telegraphy, telephony and transmission of power was also to apply the principle of earth resonance. "If ever we can ascertain at what period the earth's charge, when disturbed, oscillates with respect to an oppositely electrified system or known circuit, we shall know a fact possibly of the greatest importance to the welfare of the human race. I propose to seek for the period by means of an electrical oscillator, or a source of alternating electric currents. One of the terminals of the source would be connected to earth as, for instance, to the city water mains, the other to an insulated body of large surface. It is possible that the outer conducting air strata, or free space, contain an opposite charge and that, together with the earth, they form a condenser of very large capacity. In such case the period of vibration may be very low and an alternating dynamo machine might serve for the purpose of the experiment. I would then transform the current to a potential as high as it would be found possible and connect the ends of the high tension secondary to the ground and to the insulated body. By varying the frequency of the currents and carefully observing the potential of the insulated body and watching for the disturbance at various neighboring points of the earth's surface resonance might be detected. Should, as the majority of scientific men in all probability believe, the period be extremely small, then a dynamo machine would not do and a proper electrical oscillator would have to be produced and perhaps it might not be possible to obtain such rapid vibrations. But whether this be possible or not, and whether the earth contains a charge or not, and whatever may be its period of vibration, it certainly is possible—for of this we have daily evidence—to produce some electrical disturbance sufficiently powerful to be perceptible by suitable instruments at any point of the earth's surface." "When the earth is struck mechanically, as is the case in some powerful terrestrial upheaval, it vibrates like a bell, its period being measured in hours. When it is struck electrically, the charge oscillates, approximately, twelve times a second. By impressing upon it current waves of certain lengths, definitely related to its diameter, the globe is thrown into resonant vibration like a wire, stationary waves forming, the nodal and ventral regions of which can be located with mathematical precision. Owing to this fact and the spheroidal shape of the earth, numerous geodetical and other data, very accurate and of the greatest scientific and practical value, can be readily secured. Through the observation of these astonishing phenomena we shall soon be able to determine the exact diameter of the planet, its configuration and volume, the extent of its elevations and depressions, and to measure, with great precision and with nothing more than an electrical device, all terrestrial distances. In the densest fog or darkness of night, without a compass or other instruments of orientation, or a timepiece, it will be possible to guide a vessel along the shortest or orthodromic path, to instantly read the latitude and longitude, the hour, the distance from any point, and the true speed and direction of movement. By proper use of such disturbances a wave may be made to travel over the earth's surface with any velocity desired, and an electrical effect produced at any spot which can be selected at will and the geographical position of which can be closely ascertained from simple rules of trigonometry". In fact, Tesla proposed two different methods by which global wireless energy transmission might be achieved. The first is by atmospheric conduction using two type-one facilities as described in the previous section. The second involves the use of earth resonance principles, the creation of manmade oscillations in Earth’s naturally existing electrical charge. This was made clear in a 1932 interview in which he makes a distinction between the transmission of electrical energy by ionization of the upper atmosphere and terrestrial resonance. "I also asked him if he is still at work on the project which he inaugurated in the '90's of transmitting power wirelessly anywhere on earth. He is at work on it, he said, and it could be put into operation. He at that time announced two principles which could be used in this project. In one the ionizing of the upper air would make it as good a conductor of electricity as a metal [using a type-one transmitter in conjunction with an active receiver]. In the other the power would be transmitted by creating "standing waves" in the earth by charging the earth with a giant electrical oscillator [of the type-two design] that would make the earth vibrate electrically in the same way a bell vibrates mechanically when it is struck with a hammer. "I do not use the plan involving the conductivity of the upper strata of the air," he said, "but I use the conductivity of the earth itself, and in this I need no wires to send electrical energy to any part of the globe." "Electrical disturbances may be transmitted through portions of the earth by grounding only one of the poles of the source. Earth behaves much like a vast reservoir or ocean, which, while it may be locally disturbed by a commotion of some kind remains unresponsive and quiescent in a large part or as a whole When electrical waves or oscillations are impressed upon . . . a metallic wire, reflection takes place under certain conditions from the end of the wire, and in consequence of the interference of the impressed and reflected oscillations the phenomenon of "stationary waves" with maxima and minima in definite fixed positions is produced. The terrestrial globe may in a large part or as a whole behave toward disturbance impressed upon it in the same manner as a conductor of limited size"
"In studying the effects of lightning discharges upon the electrical condition of the earth I observed electrical waves which were produced in the earth and which had nodal regions following at definite distances the shifting source of the disturbances. From data obtained in a large number of observations of these waves I found their length to vary approximately from twenty-five to seventy kilometre and these results and certain theoretical deductions led me to the conclusion that waves of this kind may be of still more widely differing lengths, the extreme limits being imposed by the physical dimensions and properties of the earth". In Fig. 1, A designates a primary coil forming part of a transformer and consisting generally of a few turns of a stout cable of inappreciable resistance, the ends of which are connected to the terminals of a source of powerful electrical oscillations, diagrammatically represented by D. This source is usually a condenser charged to a high potential and discharged in rapid succession through the primary, as in a type of transformer invented by me and now well known; but when it is desired to produce stationary waves of great lengths an alternating dynamo of suitable construction may be used to energize the primary A. the total length of the conductor, from the ground-plate E to the elevated terminal D should be equal to one-quarter of the wave length of the electrical disturbance in the system E C D or else equal to that length multiplied by an odd number. This relation being observed, the terminal D will be made to coincide with the points of maximum pressure in the secondary or excited circuit, and the greatest flow of electricity will take place in the same. In order to magnify the electrical movement in the secondary as much as possible, it is essential that its inductive connection with the primary A should not be very intimate, as in ordinary transformers, but loose, so as to permit free oscillation. . . The spiral form of coil C secures this advantage. 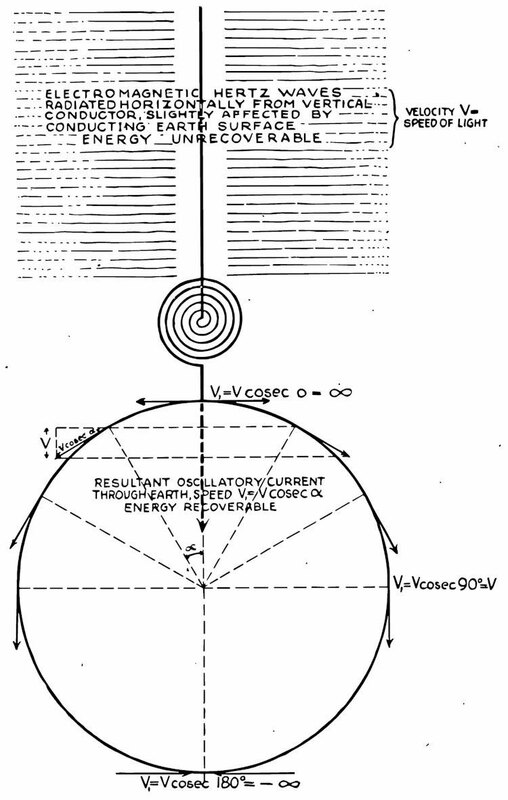 The powerful electrical oscillations in the system E C D being communicated to the ground cause corresponding vibrations to be propagated to distant parts of the globe, whence they are reflected and by interference with the outgoing vibrations produce stationary waves the crests and hollows of which lie in parallel circles relatively to which the ground–plate E may be considered to be the pole. Stated otherwise, the terrestrial conductor is thrown into resonance with the oscillations impressed upon it just like a wire. Three requirements seem to be essential to the establishment of the resonating condition. Second. It is necessary to employ oscillations in which the rate of radiation of energy into space in the form of hertzian or electromagnetic waves is very small say smaller then twenty thousand per second, though shorter waves might be practicable. The lowest frequency would appear to be six per second, in which case there will be but one node, at or near the ground-plate. Third irrespective of frequency the wave or wave-train should continue for a certain interval of time, estimated to be not less then one-twelfth or probably 0.08484 of a second and which is taken in passing to and returning from the region diametrically opposite the pole. The presence of the stationary waves may be detected in many ways . For instance, a circuit may be connected directly or inductively to the ground and to an elevated terminal and tuned to respond more effectively to the oscillations. Another way is to connect a tuned circuit to the ground at two points lying more or less in a meridian passing through the pole E or, generally stated, to any two points of a different potential. The specific plan of producing the stationary waves, here-in described, might be departed from. For example, the circuit which impresses the powerful oscillations upon the earth might be connected to the latter at two points [a type-two transmitter]. In collecting the energy of these disturbances in any terrestrial region at a distance from their source, . . . the most economical results will be generally secured by the employment of my synchronized receiving transformer. 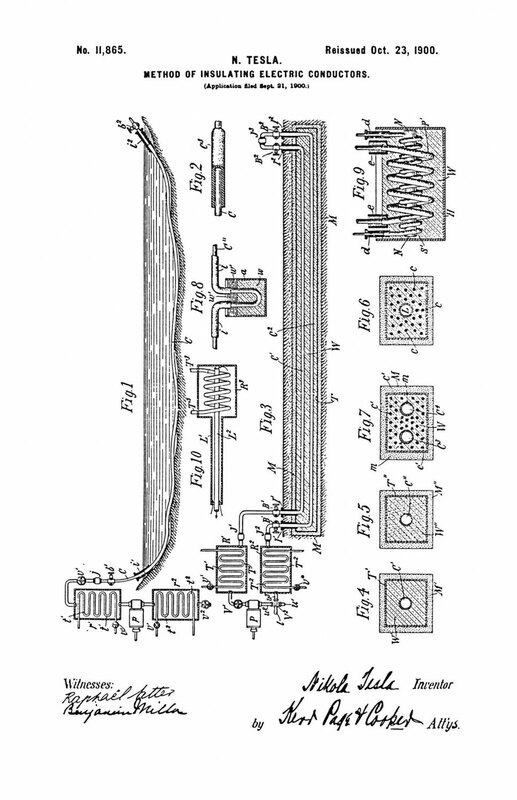 To complete this description, it may be stated that when it is desired to operate, independently, a great many receiving devices, by such stationary waves of different length, the principles which I have set forth in my patent GB14579 - Improvements in and relating to the transmission of electrical energy - 1901 and in my United States patents Nos. US723,188 - Method of signaling and US725,605 - System of signaling - 1903 may be resorted to for rendering the signals or quantities of energy intended for any particular receiver or receivers non-interfering and non-interferable. [Quote] "To give you an idea, I have prepared a diagram illustrating an analogue which will clearly show how the current passes through the globe. You know that in a solar eclipse the moon comes between the sun and the earth, and that its shadow is projected upon the earth's surface. Evidently, in a given moment, the shadow will just touch at a mathematical point, the earth, assuming it to be a sphere." Diagram illustrating the mode of propagation of the current from the transmitter over the earth’s surface. The phrase “a few miles below” gives the earth current propagation model a minimum skin depth of 3 miles, 15,850 feet, or 4,828 meters. "Assume, then, that here is the transmitter, and imagine that this is the surface of the sea, and that now comes the shadow of the moon and touches, on a mathematical point, the calm ocean. You can readily see that as the surface of the water, owing to the enormous radius of the earth, is nearly a plane, that point where the shadow falls will immediately, on the slightest motion of the shadow downward, enlarge the circle at a terrific rate, and it can be shown mathematically that this rate is infinite. In other words, this half-circle on this side will fly over the globe as the shadow goes down; will first start at infinite velocity to enlarge, and then slower and slower and slower, and as the moon's shadow goes further and further and further, it will get slower and slower until, finally, when the three bodies are on the plane of the ecliptic, right in line one with the other in the same plane, then that shadow will pass over the globe with its true velocity in space. Exactly that same thing happens in the application of my system, and I will show this next." 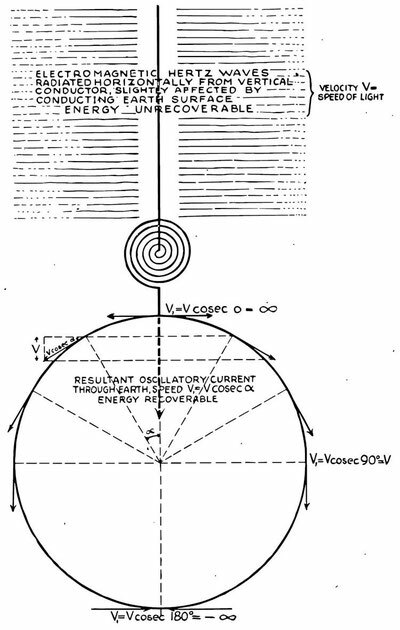 Tesla’s diagram explanatory of the transmission of electrical energy by the ground air method. This was first put before Lord Kelvin in the Houston Street laboratory in September 1897. It should be noted that in describing the “atmosphere above” as being conducting he roughly predicted the existence of the ionosphere and the earth-ionosphere cavity. Diagram illustrating the law governing the passage of the current from the transmitter through the earth, first announced in U.S. Patent No. 787,412 of April 18, 1905. Application filed May 16, 1900. See also J. Erskine-Murray, A Handbook of Wireless Telegraphy, Chapt. 17, pp. 312-330, 1913 edition, published by Crosby Lockwood and Son, London, and Appleton & Company, New York. "This illustrates, on a larger scale, the earth. Here is my transmitter -- mine or anybody's transmitter -- because my system is the system of the day. The only difference is in the way I apply it. They, the radio engineers, want to apply my system one way; I want to apply it in another way. This is the circuit energizing the antenna. As the vibratory energy flows, two things happen: There is electromagnetic energy radiated and a current passes into the earth. The first goes out in the form of rays, which have definite properties. These rays propagate with the velocity of light, 300,000 kilometers per second. This energy is exactly like a hot stove. If you will imagine that the cylinder antenna is hot -- and indeed it is heated by the current -- it would radiate out energy of exactly the same kind as it does now. If the system is applied in the sense I want to apply it, this energy is absolutely lost, in all cases most of it is lost. While this electromagnetic energy throbs, a current passes into the globe. Now, there is a vast difference between these two, the electromagnetic and current energies. That energy which goes out in the form of rays, is, as I have indicated here, unrecoverable, hopelessly lost. You can operate a little instrument by catching a billionth part of it but, except this, all goes out into space never to return. This other energy, however, of the current in the globe, is stored and completely recoverable. Theoretically, it does not take much effort to maintain the earth in electrical vibration. I have, in fact, worked out a plant of 10,000 horse-power which would operate with no bigger loss than 1 percent of the whole power applied; that is, with the exception of the frictional energy that is consumed in the rotation of the engines and the heating of the conductors, I would not lose more than 1 percent. In other words, if I have a 10,000 horsepower plant, it would take only 100 horsepower to keep the earth vibrating so long as there is no energy taken out at any other place. There is another difference. The electromagnetic energy travels with the speed of light, but see how the current flows. 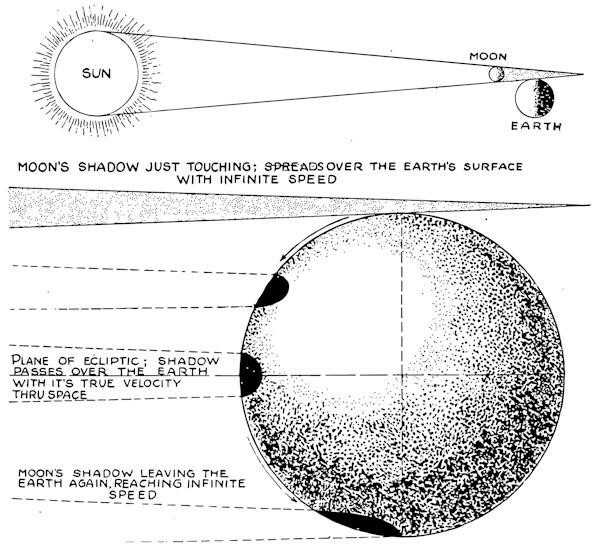 At the first moment, this current propagates exactly like the shadow of the moon at the earth's surface. It starts with infinite velocity from that point, but its speed rapidly diminishes; it flows slower and slower until it reaches the equator, 6,000 miles from the transmitter. At that point, the current flows with the speed of light -- that is, 300,000 kilometers per second. But, if you consider the resultant current through the globe along the axis of symmetry of propagation, the resultant current flows continuously with the same velocity of light. Whether this current passing through the center of the earth to the opposite side is real, or whether it is merely an effect of these surface currents, makes absolutely no difference. To understand the concept, one must imagine that the current from the transmitter flows straight to the opposite point of the globe. There is where I answer the attacks which have been made on me. For instance, Dr. Pupin has ridiculed the Tesla system. He says, "The energy goes only in all directions." It does not. It goes only in one direction. He is deceived by the size and shape of the earth. Looking at the horizon, he imagines how the currents flow in all directions, but if he would only for a moment think that this earth is like a copper wire and the transmitter on the top of the same, he would immediately realize that the current only flows along the axis of the propagation. I hope that I have been clear in this exposition – in bringing to your attention that what I show here is the system of the day, and is my system -- only the radio engineers use my apparatus to produce too much of this electromagnetic energy here, instead of concentrating all their attention on designing an apparatus which will impress a current upon the earth and not waste the power of the plant in an uneconomical process." This is what that Ancient Egyptians did. The Earth is a giant magnet. We use fossil fuels it put a few families in control and they do not care about the health of the web of life that exist on a planet that belong to no one and its fruit they want for themselves. The Ancient were way more advanced than us because they were a spiritual one that understood the balance of the great "ALL" We are dying a spiritual self as we drift further int that material realm. Before these men instigated war so the birth of an electric age. It was killed by greed and keep in its infancy as we would get addicted to the quick power of these filthy fuels. This way if anyone looked back at electric energy as a source the fear of taking a step in reverse until it caught up. Vril energy. Same as being connect to the Earth's life force. Of course it was was a woman in charge of this order Maria Orsitch was the mother of.Great Pyramid is a pivot point for all continents on the Earth. The same use of the Wardenclyffe Tower if the frequency is not correct could cause what happened during Atlantis's try to reach not only to harness the planet but all of them. Causing a pole shift and Venus pushing Mars out of its true orbit. Venus was a moon of Saturn.